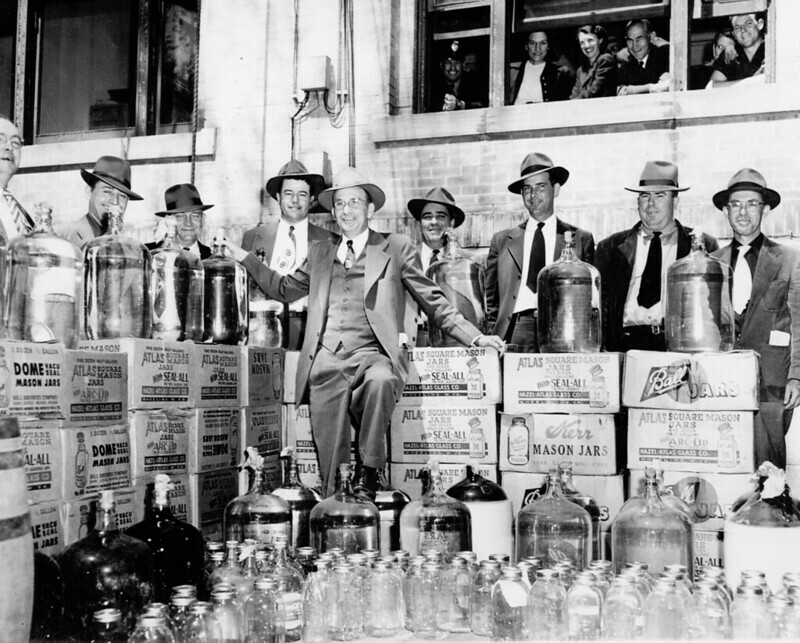 A 1951 moonshine bust in Johnston County. Image from the State Archives. On August 2, 1958, the Saturday Evening Post profiled Percy Flowers of Johnston County, labeling him the “King of the Moonshiners.” Throughout his career, Flowers managed to stay just out of reach of the law and developed a reputation as a local Robin Hood. Born in 1903, Flowers grew corn and tobacco on his nearly 5,000 acres, like many others in region did. Unlike most others, he began to use some of his corn for making illegal liquor, concealing the stills and spirits in his tobacco barns. Flowers’ first brush with the law came in 1935 when he and his brothers assaulted a federal treasury agent. His brothers served time for the incident, but Flowers was sprung after only three days when a judge stayed his sentence. His attorney argued that 22 sharecropper families were dependent on Flowers for their livelihood. A bigger bust came in 1957 when agents searched and padlocked his store, seizing his safe and its contents which reputedly included large amounts of cash. The jury deadlocked over the charges but the judge found Flowers guilty of contempt for publicly berating another agent in the courthouse lobby. Six months in the federal penitentiary followed, the longest sentence he faced. Flowers farmed well into the 1970s, and he died in 1982. I started working in Smithfield in 1985, Percy Flowers was still talked about then, and for a long time after. In 1980 I was visiting Quito, Ecuador. I knew several students at NCSU who were from there. One of their father’s (an extremely wealth man) invited us for dinner. Over drinks, he asked me if I knew Percy Flowers. I told him: only by reputation. He told me that he had run liquor for Percy back in the 40s or 50s. He was working on a horse farm in Kentucky and was approached by one of Percy’s agents to move liquor in the horse trailers when they went to events around the country. A similar question was asked of me when I was chatting in a bar in Brazil in 1983. Yes its wonderful how we glorify the criminals in this country. How often they get away with breaking the law and we applaud them. It is still going on today. Especially when they are wealthy and strong.Or have access to wealth. We also have our share of greedy attorneys and those who are sworn to protect us from those who are in good with the law and the Judges. Its amazing. You are SO right!! And, it is so SHAMEFUL!! and today his daughter is still making lots of money on the land he made moonshine on. the car engine was cold. He laughed til the day he died telling that story. I think it’s time for Percy’s affiliation with the KKK to be exposed. He was the Grand Dragon of the KKK in the 60s and 70s. My first clear memory of North Carolina is from 1968. Shortly after we moved here we went to the beach for the first time. US 70 passed through downtown Smithfield in those days, and where it went under the railroad tracks just east of downtown there was a billboard showing a robbed Klansman with a burning cross behind him and the sign said “The KKK Welcomes you to Johnston County”. Years later I recounted that story to a black gentleman I worked with. He’d grown up around there and remembered the sign well and said Percy Flowers was responsible for it. I also understand that Johnston County stayed dry for so long because the Flowers family was politically powerful and didn’t want the competition.